Welcome to Self-Help Set Theory, the study of two or more sets in relation to each other. Today, I will be introducing you to the simplest form of Set Theory, a subset within an infinite set. The Rectangle above represents the infinite universe. The Circle within the rectangle represents You in the infinite universe. The infinite universe, the rectangle, contains all that is. 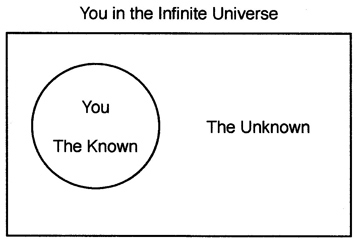 You, the circle, are part of the infinite universe and lie within the rectangle. What can we say about the known? The known is known, the tried-and-true, the comfort zone, the been-there-done-that of life, the same-old-same-old and land of the ego. In other words, it’s your past. Nothing new or exciting here. What can we say about the unknown? The unknown is in the here and now, where new things happen, dreams are realized, opportunities seized and skills mastered. the unknown. Knowing what you know now, where would you like to focus your life? “The unknown,” you say? Good answer! Allow yourself to experience as many new things as possible. Think outside your circle. Dream bigger dreams. Question your limiting beliefs. Learn as many new things as possible each day and consider new and innovative ways of doing the things. Observe others that have succeeded where you wish to succeed and incorporate their strategies. Ask for help from positive and nurturing souls, and in turn, share what you have learned with those that seek your knowledge. And above all else, stay as present as possible in each and every moment. I was recently working with a sculptor that wanted to drastically change how he created his art. No matter how hard he tried, he kept going back to his old way of doing things. During one of our conversations, he mentioned his concern that others would not be able to recognize his new works as his. From that day on, I had him imagine in great detail his art space filled with all the new pieces he had yet to sculpt, the colors, the sizes, the lighting, the lines of the pieces and the people that would come to purchase his work. Open many doors and windows of creativity. Help you develop a knowing it can be done. “Reinstill” your ability to create your life. There are numerous books on visualization and numerous ways to visualize. 1) Determine what you wish to be, do, have or create. 2) Find a quiet place to sit or recline, close your eyes and find a comfortable breathing pattern. 3) Imagine each breath out is releasing tension and each breath in is filled with light. 4) Imagine yourself surrounded by light. 5) Now begin to create vibrant, positive and moving images that envelop you. Experience in the great detail what you want. 6) When you feel you have fully experienced what you came to experience allow yourself to be surrounded by light again. 7) Slowly focus back on your breathing, gently open your eyes and begin again to pursue that which you want. When you can see it in your mind it’s no longer way out there and untouchable. It’s not so intimidating. You’ve been there and done that in your mind. It’s now possible and attainable. You simply have to take the necessary steps toward achieving it. If you’ve creating a compelling enough visualization then it’s just a matter of time. A buddy of mine, who felt he needed a vacation, went on a trip for four days. When he got back, he told me he had the time of his life and felt like a whole new person. A week later, he was back to his “poor me” self. So I ask you this question. What changed? My friend had. On his vacation he decided to have a good time and experience life to the fullest. Oxford American Dictionaries defines a tourist as “a person who is traveling or visiting a place for pleasure.” That’s what my friend was – a person, traveling and seeking pleasure. Now, let me ask you a second question. Aren’t we all people, traveling from here to there every day, desiring pleasure in our lives? YES! Then wouldn’t that make us all tourists all of the time? YES! And being tourists all of the time, shouldn’t we be seeking (allowing) pleasure all of the time? YES! So, today, I have the great honor of declaring this and every day, Permanent Tourist’s Day, to be celebrated by you and everyone you know. 1) Intend on having a good time. 2) Desire to experience new things. 3) Be optimistically ready for anything. 4) Live in the positively present moment.